Myrtillocactus geometrizans is one of two cactus with the common name 'Mexican fence post' because in northern Mexico it is sometimes used as living fence posts. It is one of my personal favorites because of its deep blue color and its paucity of spination. Let's see YOU use 'paucity of spination' in a sentence, Pancho. Myrtillocactus geometrizans doesn't pup or offshoot, but it will put out side stems that can be cut off, calloused, and planted. 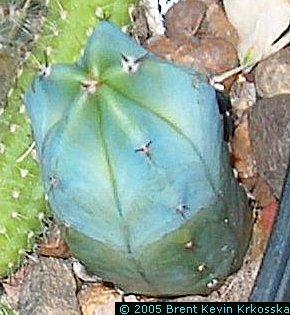 Myrtillocactus are tolerant of cold and occasional excess water.